Setting up political parties is not exactly what we have become accustomed to expect from radical activists. Yet, this is precisely what some of the participants in the last few years of protest and occupations are now busying themselves with. From Spain to the US, Greece to Turkey, many protesters have been persuaded that to do away with the 1% dominating the 99%, it will not be enough simply to resort to the heroic arsenal of street politics. After taking to squares, many now feel the time has come to occupy the state. White’s comments – which came after a meeting with Beppe Grillo, the leader of Italy’s Five Star movement, the anti-austerity party that won 25% of the vote in the last general election – might appear as a shot in the dark. But elsewhere this electoral turn is already in full steam. Take the enigmatically named X party (Partido X), in Spain. This political formation has emerged out of a wing of the indignados movement, and is tipped to run in the European elections of 2014. Similar to the Five Star movement, the X party’s platform centres on the promise of a new electronic democracy, that chimes very well with the desire for participation expressed in the occupied squares of 2011. Other activists connected with the occupation movement wave – in countries such as Israel, Turkey and Greece – are trying to open up more traditional left parties and to use them to continue where the street movements stopped. 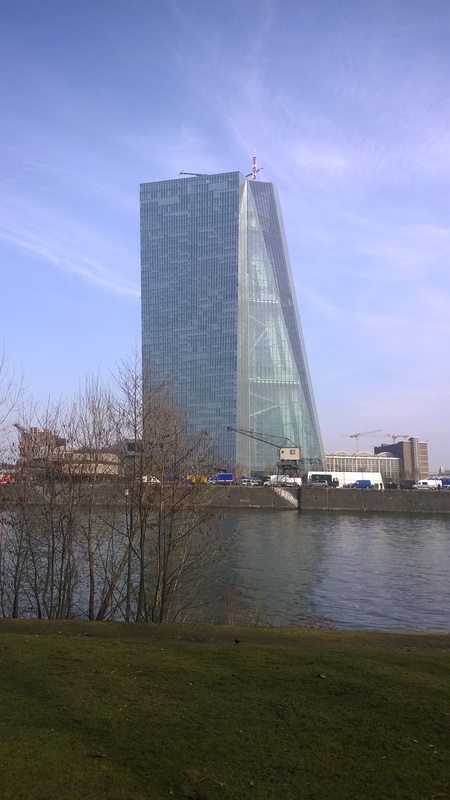 ECB building Frankfurt a. M.
It is not difficult to understand the reasons behind this new interest in electoral politics. The financial crisis of 2008 has brought about a tectonic shift in public opinion. A number of impressive results for left formations, from the great showing of Syriza in the 2012 Greek elections, to the recent victory of De Blasio in New York, and the election of student leader Camila Vallejo in Chile, have shown the extent to which the electorate is looking for radical progressive alternatives. Naturally, not everybody within the occupation movement is buying into this strategy. Many continue to see the state as the source of all evil, and in electoral politics a manifestation of despicable reformism. Yet, having to confront on a daily basis a difficult economic situation that begs for fast and realistic solutions, many have come to view new forms of engagement with political institutions favourably. If there is something that the financial crisis and austerity politics has taught us, it is that, for all the recurring predictions about its ultimate disappearance, the state continues to deeply influence our lives. We have learned that the provision of the public services we cherish the most – education, health, public parks – is largely dependent on decisions taken at state level. Naturally, it would be foolish, in a world of global capitalism, to think that once the state is occupied, one can do as one wishes. But why shouldn’t we also use the state, to secure new universal rights – free health, free education, free transportation, decent housing for all – of the type that have been prefigured in the occupied squares of 2011? Anti-globalisation activists believed that, as asserted by Marxist scholar John Holloway, we could “change the world without taking power”. Many in the new generation of activists have become painfully aware that in order to achieve real change you also need to take power; that in order to really scare the 1%, you also need to occupy the state. This article was originaly published under a CC BY NC SA 3.0 licence here by Paolo Gerbaudo. The pictures are published under a CC BY SA 3.0 licence by Philipp Adamik. You can buy his book “Tweets and the Streets” here.